2964. my name on the list to sing with the IWU Alumni Chorale at Homecoming!!! 2976. Elijah: "When I have a birfday, I will be five! An' I'll have five cicadas." Me: "Um...you mean candles?" Elijah: "Yeah. Five candles." 2912. plane tickets to NYC purchased for a fall girls' weekend with my mom and aunt!! Still hoping to capture the missing shots before the month is out. Today was the first time I've managed to do Ten on Ten since my first time participating last November. I had my camera out alllll day, but you know, it is really hard to get *good* shots hourly(ish)! Even when I stretch it to "taken within the 4-5 window" rather than more precisely on the hour. Most of my best pictures from today were taken in a two-hour window--so it's kind of annoying because I can only use a couple of those, and then I'm scrambling to take a picture of something stupid like chopped onions later in the day. Alas. Steve had the day off after working all weekend, so we declared a family day. It was a perfectly gorgeous day for a six-mile walk! 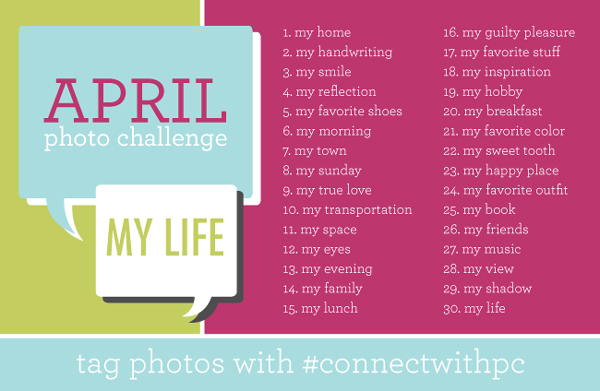 This month I'm participating in Paper Coterie's My Life photography challenge. I've started these things at least two or three times in the last few months, but I've made it to day 7 this time, so I'm hopeful about completing the project! 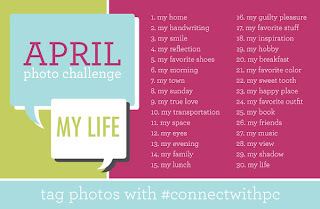 The task is to document a different element of your life every day for the month of April. Some are simple to snap a quick photo; others require some thinking and choosing before you can even begin to compose a shot. I'm having fun so far--it's definitely good for me to have my camera out more--and thought I would do a weekly blog post with each week's collection of photos. to God who fulfills his purpose for me." Yet another version of that beautiful promise from Philippians 1:6 and Job 23:14 : God WILL complete the good work He began in me. His purpose is to conform me to the image of His Son, and it WILL be fulfilled! That's just who God is: "God-who-fulfills-his-purpose-for-me." But notice the juxtaposition of these two lines: He is God Most High, subject to no one, unsurpassed in greatness, unmatched in the universe. He is glorious and mighty, exalted far above all. He is King of Kings and Lord of Lords. Who am I? Just one of six billion people on the planet today; just one of countless millions who have lived since Eden. When you consider all that this Most High God has to control and direct and keep track of--the universe of stars and planets, let alone the workings of our planet alone, the winds and waves, governments and kings, animals from the rhinoceros to the gnat, invisible viruses and cancers...how is it that He even knows my name? But He doesn't just know my name; He knows how many hairs are on my head! and He not only knows all about me, my every thought before I speak--He loves me. His is not a detached, clinical knowledge; it is a knowing and loving, knowing and choosing, knowing and adopting and redeeming and transforming. How is it that this Most High God could have a purpose for me, much less one so grand as to make me like His Son? It seems to me that the really amazing thing isn't that God fulfills His purposes--that seems so obvious as to be self-evident. Of course He does; who could thwart the Most High? No, the incredible thing is that He has a purpose for me at all. And yet it's true. Praise His name. women who trust me with their hearts. probably going to make salmon croquettes for dinner (doesn't that sound so much more sophisticated and delicious than "fried salmon patties"--ew--which is basically what they really are?). I'm pondering the possibility of making a traditional Passover meal on Thursday night--which means I need to get going with printing recipes and grocery shopping. too-small jean shorts (ugh...none of my favorite clothes fit! ), a gray tank top and a pink t-shirt, plus the black Reef flip-flops that generally don't come off my feet from April-September. I have just about worn completely through the soles in one spot, so I may have to invest in a new pair this year. that prayer guide for parents that I first mentioned the better part of a year ago--I really have been working on it. I also created some cards over the weekend for the first time in a long while. It feels good to get my supplies out and be creative...I need to make time for that kind of thing more often, and provide creative outlets for my children. to be joining a little "Biggest Loser" competition with some friends starting on Sunday. I don't have a ton to lose, just about ten extra pounds or so, but I definitely need to lose them so I don't have to buy a bunch of new clothes. This competition is just the motivation I need to get back in shape with exercising and eating better since my internal motivation seems to have gone missing. a variety of books: just finished Treasured: Knowing God by the Things He Keeps and Harry Potter and the Order of the Phoenix (#5). I'm thinking and arguing my way through Doug Wilson's Recovering the Lost Tools of Learning: An Approach to Distinctively Christian Education (a bit frustrating at times since his tone makes it clear that the subtitle would more accurately read, "THE Approach"--but still very helpful and provocative). My Kindle switches back and forth between Reliving the Passion, a Lent devotional (only $3.99 for Kindle! ), and Paul Tripp's Forever: Why You Can't Live Without It. And I've now picked up The Fellowship of the Ring, in an attempt to give the famed Lord of the Rings trilogy a fair trial. I haven't touched Tolkien since reading and hating The Hobbit in junior high, but I've discovered a few fantasy series I've loved since then, so we'll see. Bible-wise, I'm in Isaiah and Psalms. Loving the reading plan I'm using, though struggles to get up early have left me a little behind recently. to book plane tickets for an exciting trip soon. the sounds of Elijah talking to and for his stuffed animals instead of napping :) Plus lots of bird songs, and loud trucks driving by. a shower at the end of a long, hot day and then climbing into bed with fresh, clean sheets. unlike the last few, this is a pretty low-key week. I'm looking forward to prayer with friends tonight, and hoping to take the boys downtown to run a couple of errands and enjoy Centennial Park later this week. Steve has to work all weekend, so I'm not looking forward to that--but the reward is extra vacation days, one of which we plan to use next week by checking out the Cumberland River Bicentennial Trail. I've been told there's a huge railroad trestle bridge that Elijah will just love. I think I've shared plenty of those already :) Happy Tuesday!